Though World War I officially ended with the Treaty of Versailles on June 28, 1919, the fighting ceased seven months earlier when an armistice, or temporary cessation of hostilities, between the Allied nations and Germany went into effect on the 11th hour of the 11th day of the 11th month. 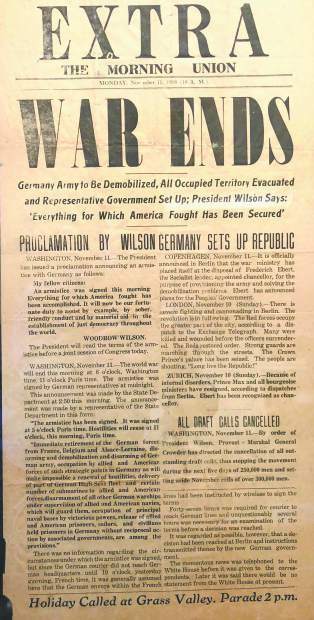 Nov. 11, 1918, which President Woodrow Wilson proclaimed as “Armistice Day,” is generally regarded as the end of “the war to end all wars.” But, of course, “The Great War” did not end all wars. With that approval in 1954, Nov. 11 became a day to honor American veterans of all wars. And that includes those who hailed from Nevada County, including the nearly 9,000 who now call it home. Some of us are the offspring of veterans, including a member of our board whose father was in the Navy on a World War II mine sweeper in the Pacific, and whose grandfather served in World War I, as an Army surveyor/field engineer in France. Her family’s service extends back generations to a man who served in two local militias in Pennsylvania during the Revolutionary War. Another family member was a minuteman at the Lexington call. Another of us is married to a combat arms veteran, becoming an Army wife as a young bride. She sees that servicemen, and women, often seem to understand the vital peace-keeping role of a strong U.S. military better than those who haven’t served. When conscription meant most men served, they shared a valuable coming-of-age experience in taking a turn manning the ramparts. Today, in the day of an all-volunteer military, she says we must continue to educate our neighbors on what our veterans have done and continue to do for us. Some of us actually served, including a combat veteran — 38th Infantry Scout Dog Platoon, out of Cu Chi, Vietnam — walking patrols for one year with a German Shepherd named Sam. It was all in hopes of detecting an ambush just a bit before it was initiated. For him, Veterans Day is about honoring those who were there, in all the wars that preceded that conflict, and all of those that followed, as well as for those who are on the job as we write. Another of us served in the U.S. Army. He remembers from his peacetime service (1958-61) how much he wanted to be out of uniform and back in “civvies.” But today, he values that time as more important in character building than an equivalent time in college. Then with the draft still in effect (and he feels it still should be), his brothers were assembled from all levels of society. When he sees young men and women wearing uniforms in places like airports, he has to suppress the urge to salute, though he does so now. Our community is blessed by organizations leading efforts to support our local heroes, such as the American Legion Auxiliary, the Blue Star Mothers of America’s Sierra Nevada chapter, Friends of Nevada County Military, All Veterans Stand Down, Wags and Warriors, Welcome Home Vets, Women Veterans Alliance, Nevada County’s Veterans Service Office and the large number of service organizations that support our veterans, among others. Supporting them supports those who serve. We honor our veterans each Nov. 11, but let’s honor them every day by dedicating the resources necessary to meet their needs within the Department of Veterans Affairs. Let’s honor our commitment to the bravest among us by providing the promised benefits and support they need to move forward from their service. Because 100 years later, we know the Armistice of the “Great War” did not end all wars. We do live in a dangerous world. We are grateful for those willing to stand up to serve. As a community and as a country, we need to thank those whose commitment means, despite differences that seem to divide us, they will come together in unity to answer the call of duty to keep us safe. Honoring our heroes, as they serve or when they come home, is the least we can do.